Abstract: Spinal cord injury is a rare disease with an incidence about 40 cases per million population in the USA. The most common reasons are traffic accidents, falls, violence and sports. 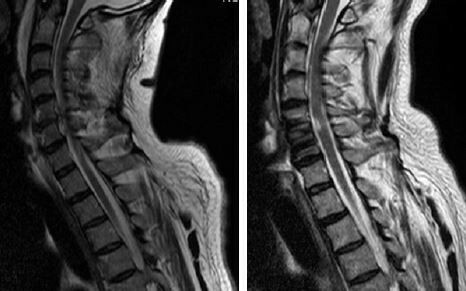 A 53-year-old male patient presented with an incomplete tetraparesis as a result of a spinal cord injury after a boat accident. It was not possible to treat him with steroids because he was out of the therapeutic time period of 8 hours when he presented to the hospital. The main problem of spinal cord injuries is the secondary injury caused by inflammation and swelling of the spinal cord. To avoid this, the patient was experimentally treated with erythropoietin (EPO) intrathecal and EPO, granulocyte-colony-stimulating factor and vitamin C subcutaneous after his initial spinal cord relief surgery. These drugs might be able to relieve this secondary reaction but were never applied for this indication in human before. This study shows that it could be a promising treatment for spinal cord injuries with potential therapeutic benefits.